Last month, we asked you to share why you love your LYS, and we received some fabulous entries for our contest! There are so many fabulous stories here in our contest thread - we wish we could share them all! Below are a few of our favorite posts, be sure to keep reading until end to find out who won our prize drawings! I love The Yarn Shop in Lincoln, Nebraska! It is an amazing place to hang out; we have potlucks and casual days where people come in to knit together and laugh. It is the place to be in Lincoln! The owner, Mittra, is very helpful and really makes the place welcoming and her employees are the best! This is a flashback to last year's Christmas party! I don’t know what I would have done without the owner and all the ladies at my LYS Black Sheep Yarn Shop in Maryland. When I was diagnosed 4 years ago with a rare muscle disease, it became my refuge and Happy place. I was either at the hospital, home or at my LYS. It also was wonderful that many of my friends there are nurses or worked in the medical field. I remember we were doing a KAL for the Hitofude Cardigan and working on this lace project kept my mind from worrying. 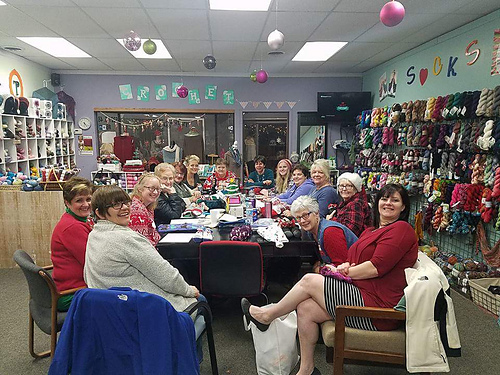 Donna has made her shop a place to celebrate life’s joyous times as well as a place to comfort and encourage each other when times are tough. The laughter outweighs the tears. I also purchased my favorite toy, my Knitter's Pride ball winder and swift there and really enjoy how beautiful all the pretty colors of the wood is when it is spinning around. With all the gorgeous yarn there, one feels like a kid in a yarn candy store! 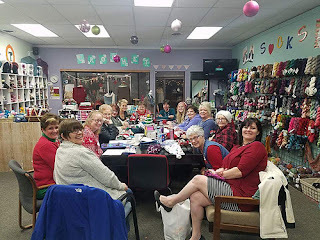 One of the best things about Donna and her staff is that they are always ready to help any knitter who is struggling with a project or need to understand which yarn is perfect for their project. Apple Knits and Purls, located in the lovely landshore city of Muskegon, Michigan. Encountering this knit shop has been the best thing I’ve done in my adult life. I’ve never enjoyed group gatherings as much as I do here. We get together for “fix it” days, we knit, crochet, and exchange stories… of our lives, our projects, the world. Chantella, the owner, gives us strength and confidence during our gatherings. I come away feeling rejuvenated and inspired. Her store carries a multitude of different yarns…all excellent quality…nothing but the best. The Shop is small, but packs a large punch in every arena of quality yarns and assortment. Just love my LYS! 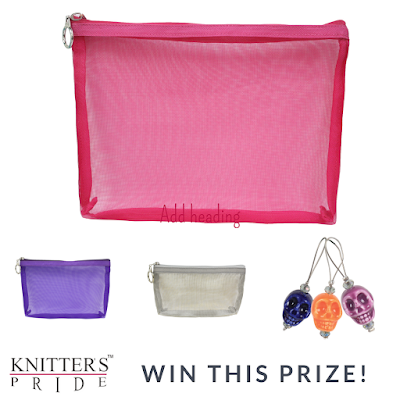 Chosen by the Random Number Generator, the following entries have been selected to a prize from our NEW collection (a Ginger Deluxe Interchangeable Set, a Zing Crochet Set, or a Magnetic Knitters' Necklace Kit are all up for grabs)! Winners will be contacted and given their choice of prize on a first come, first serve basis. My LYS is Tangles Knitting on Main in Waxhaw, NC. It’s little over 3 months since I moved to NC and found this nice, cozy, well organized store with lovely owner. I joined the knitting/crochet group over there and over the summer, we did a great project together for our town - a beautiful yarnbomb mural, Waxhaw flowers. So glad that I’m part of this special community. My favorite LYS is actually on the other side of the country. I live in a very rural area…so I haven’t got a LYS. HOWEVER, we travel, and my most frequently visited yarn store for over twenty years, is thousands of kilometers from my home. I visit every time I am in Nova Scotia, and I’ve had her mail yarn to me as well. PatriciaLynn of Baadeck Yarns in Baddeck, Nova Scotia provides excellent customer service…and got me into Knitter's Pride needles! My favorite LYS is Silk Road Textiles in Cincinnati. A beautiful shop with fabulous staff. The knitting classes are wonderful as are the open knitting sessions. I have made plenty of new knitting friends. It is always a joy to go to the store. 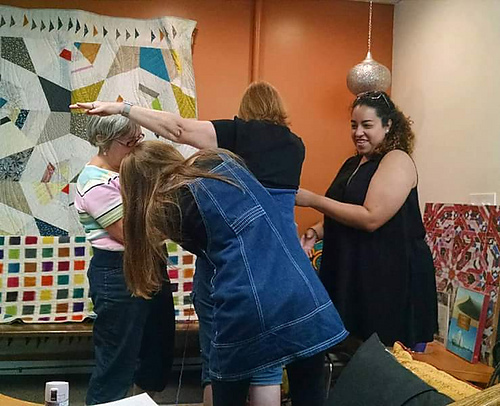 Here we are helping make sure a sweater vest is going to fit! 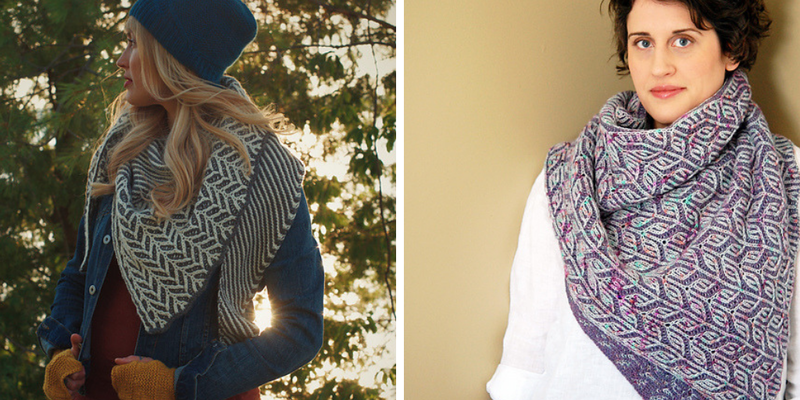 Thanks to everyone who entered our contest; we hope you'll continue to show your LYS some love this fall! Make sure that you are signed up for our newsletter, where we'll be awarding prizes from our new product line each month to active subscribers. Click here for details on our current drawing! 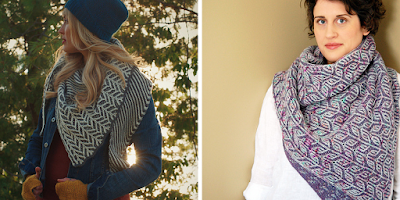 We can’t get enough of the brioche knitting trend - although it’s an older technique, brioche is seeing a resurgence in tons of new designs for hats, cowls, shawls and sweaters. In today’s post we’re going to show you the basics so that you can give this technique a try. First, let’s talk about what brioche actually is: this technique creates a lofty, reversible, ribbed fabric created by accomplished by slipping stitches and creating yarnovers in one row that are then knit together with stitches in the following rows. Many patterns use two colors of yarn, which can be easier especially when you’re first starting out, but you can also knit 1-color brioche as well. Knitting a Brioche swatch with needles from our new Ginger Special Interchangeable set. 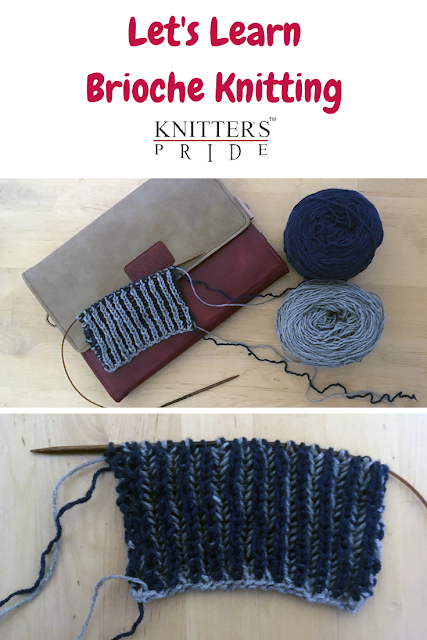 Sl1yo stands for slip 1, yarnover, and it is a stitch you’ll be using on every row. 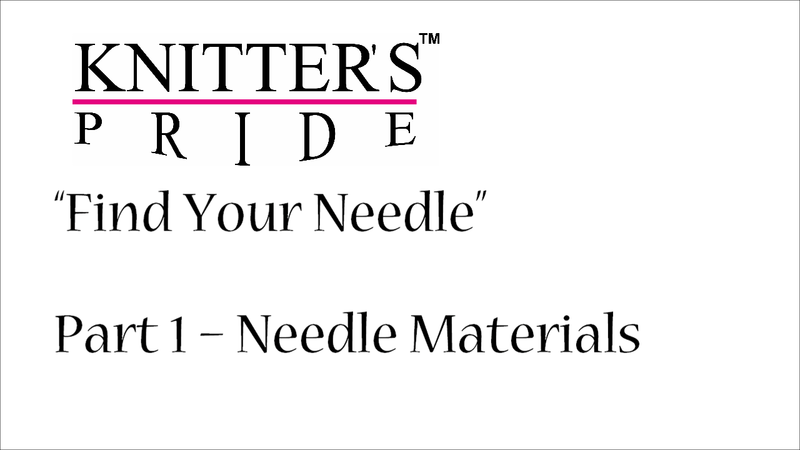 You’ll need to slip the next stitch from your left needle to your right needle, while simultaneously wrapping the yarn around your needle from front to back. This slipped stitch and its corresponding yarnover will be treated as 1 stitch in the subsequent row. The second slightly tricky thing to understand about 2-color brioche is that to create a reversible fabric, each row is actually knit twice: once with Color 1, and once with the Color 2 - so for each 2 rows of knitting, you are actually knitting 4 rows. Essentially, each side of your piece will have a color that is dominant on it. If we’re talking about Color 1, a light color, and Color 2, a dark color, let’s say that the Right Side of your work will have Color 1 as the dominant color and the Wrong Side of your work will have Color 2 as the dominant color. On each Right Side row, you will first knit and slip stitches across in Color 1. Then, without turning your work, you will slide the stitches back to the beginning of the row you just worked and you will purl and slip stitches across in Color 2. You have now completed the first, Color 1 dominant side of your brioche. On each Wrong Side row, you will first purl and slip stitches across the row with your Color 1. Then, without turning your work, you will slide the stitches back to the beginning of the row you just worked and you will knit and slip stitches across with your Color 2. You have now completed the second, Color 2 dominant side of your brioche. Row 1 (RS/Color 1): *Sl1yo, brk; repeat from * to end. Row 2 (RS/Color 2): *Brp, sl1yo; repeat from * to end. Row 3 (WS/Color 1): *Brp, sl1yo; repeat from * to end. Row 4 (WS/Color 2): *Slyo, brk; repeat from * to end. As we mentioned at the beginning, there are hundreds of brioche knitting patterns to choose from these days! Here, we’ll spotlight a few favorites to try, starting with Lisa Hannes’ All About that Brioche. 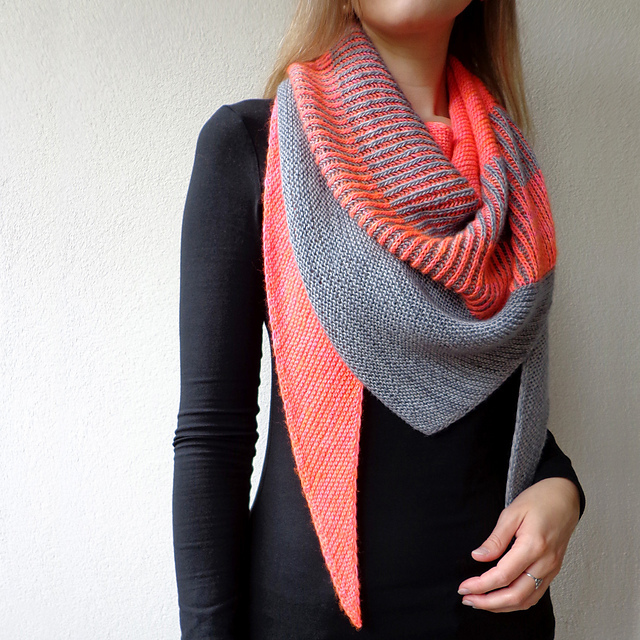 This triangular shawl combines garter stitch blocks with sections of brioche knitting to create a wearable accessory that is also a great introduction to the technique! 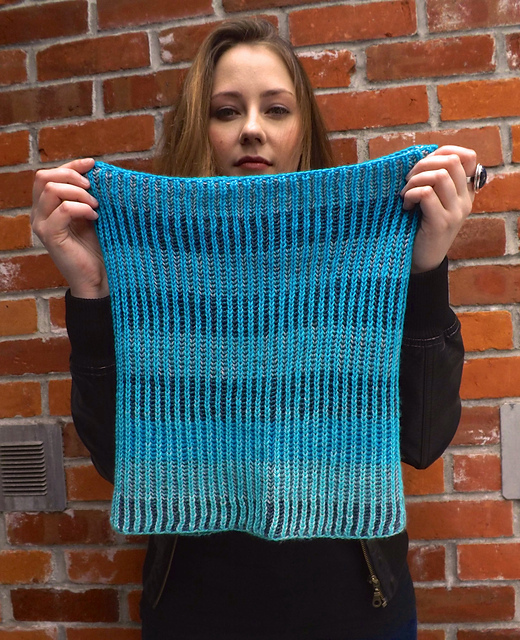 If you’re looking for a free pattern on Ravelry to practice your brioche, we recommend Emma Galati’s Brioche for Beginners cowl. Emma uses slightly different abbreviations than we have here, but her pattern is a simple 2-color brioche cowl designed for beginners, and because it’s knit in the round, you may have an easier time mastering the technique without becoming confused about which side is the right or wrong side of your fabric. Once you’ve conquered the basics, there are even more fun patterns to try, such as Andrea Mowry’s Ramble (below left) or Leslie Ann Robinson’s Sizzle Pop (below right). You can find more information about brioche knitting on Nancy Marchant’s wonderful site Brioche Stitch. For a few tips and tricks about brioche, check out this post from Ann Shayne of Mason Dixon Knitting. We look forward to seeing your brioche knitting projects on social media - don’t forget to tag us in your post!